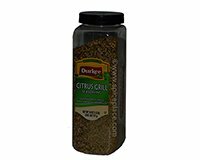 Durkee Citrus Grill Seasoning is a Citrus-Lemon flavored seasoning enjoyable with fish and other seafood, chicken, rice and vegetables. This unique blend of tart lemon peel, warm dill, and pungent garlic that adds a refreshing flavor to grilled fish, seafood, and poultry. Combine Durkee Citrus Grill Seasoning with melted butter to create a dipping sauce for shrimp and lobster. Add zing to your vegetable side dishes by sprinkling over fresh carrots, zucchini and green beans before cooking. Ingredients: Salt, Sugar, Spices, Food Starch-modified, Citric Acid, Dehydrated Red Bell Pepper, Dehydrated Garlic, Dehydrated Onion, Lemon Peel, Maltodextrin, Natural Flavors, Extractives Of Paprika (Color), Soy Lecithin. Allergy Information: Contains Soy. Sprinkle one side of a salmon fillet with Durkee® Citrus Grill Seasoning using about 2 tsp per pound of salmon. Grill or broil until fish flakes with a fork. Serve with a dipping sauce made with 1/2 cup sour cream, 1/2 cup mayonnaise, 1 tbsp pickle relish, and 3/4 tsp of Citrus Grill Seasoning.